Though the global economy is still shaking off the effects of the past and current financial crises, banks in both the emerging and developed economies have an opportunity to manage enormous capital growth and wealth creation. To regain customer confidence and earn their slice of the increasingly competitive market, banks must transform themselves by jettisoning old, product oriented operating models to become a client centric operation. 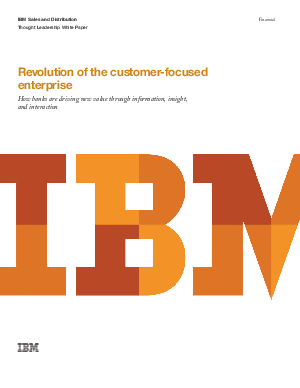 Read this insightful paper from IBM Global Business Services to understand how banks can effectively use the information they have and become truly customer centric by re-organizing their operations around customer differentiation, pricing, product bundling, channel consistency and customer engagement.